This work is called 'Flower' and was done in one of my process art classes. The class was about Symbols. The works were created by printing with dyes, printing inks and wet clay using any object that was flat enough to print or stamp a mark onto the paper. There was a vast selection of objects and shapes to choose from. 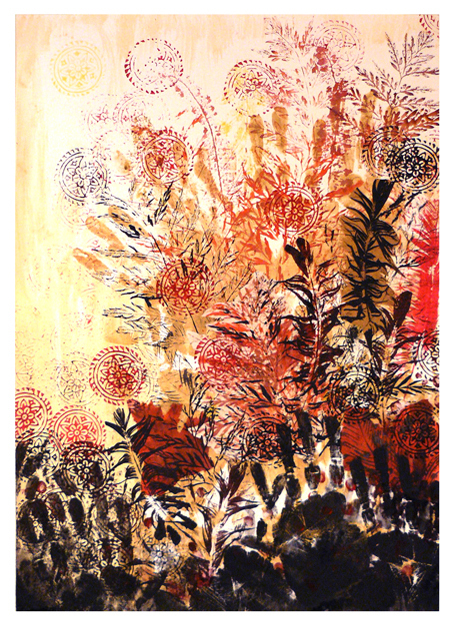 I was drawn to using my hands, dried leaves, feathers and a beautiful old wooden printing block with a flower design. I started off by covering my hands in wet clay and making brown 'clay prints' onto the paper. I was feeling a bit 'paniced' and out of my depth having no direction or plan in mind. (Process art is a creative journey or process, rather than the end product of art and craft, which takes some getting used to.) Getting my hands 'dirty' and making a bold start really helped me to get into the session. 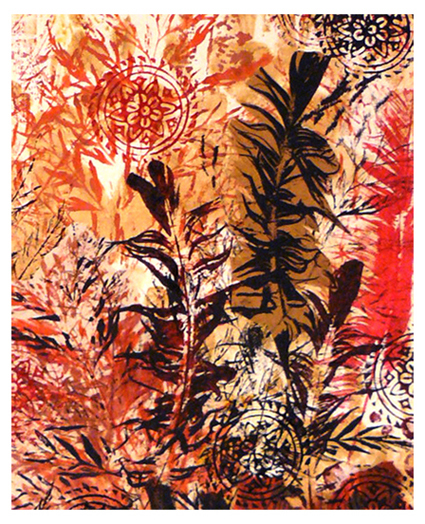 I experimented with some dried fine leaves, feathers and the flower stamp and made prints using red and orange dyes that are quite translucent and black and red printing inks that leave a bold, opaque print. At times the test prints that i did on separate paper turned out so well that i cut or tore them out and collaged them into my final artwork. I used a wet Rooibos tea bag to stain the paper and finished off with some hand prints in (sticky) black printing ink. done on brown paper, cut out and collaged into the final artwork. Hand print - Symbol of a human's life, achievements and legacy, the creative spirit, channelled energy. Feather - Sacred universal symbol of flight within the spirit world and serving as messenger to Great Spirit. Flowers - Symbolise a relationship to the sun. A list of other symbols and their meaning can be found here.